Recombinant monoclonal antibody to CD33. Manufactured using AbAb’s Recombinant Platform with variable regions (i.e. specificity) from the hybridoma hP67.6 (Gemtuzumab). 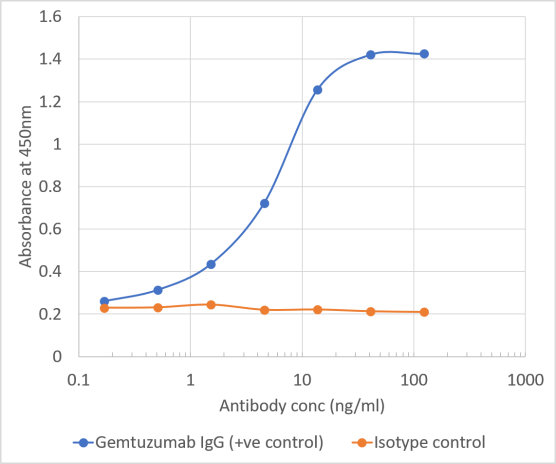 Immunogen: Gemtuzumab was generated by huminization of the murine P67.6 clone, raised against CD33-transfected FMY9S5 cells of human origin. CD33 is a transmembrane receptor expressed on predominantly on cells of the myeloid lineage, but it can also be found on some lymphoid cells. Application Notes: A human IgG4 variant conjugated to derivative of the cytotoxic drug calicheamicin gamma 1, N-acetylcalicheamicin dimethyl hydrazide, has been used as a therapeutic against acute myeloid leukemia. This antibody may also be used in flow cytometry and immunofluorescence. Note on publication: Describes the use of the parental antibody conjugated to a radionucleotide in marrow irradiation. 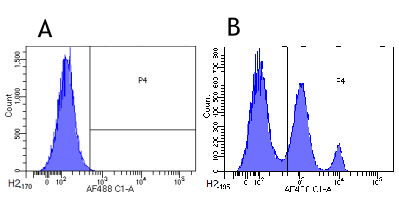 Flow-cytometry on human leukocytes using Ab00127. 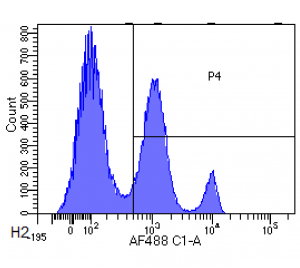 Flow-cytometry using anti-CD33 antibody hP67.6 (Gemtuzumab) (Ab00283) Human leukocytes were stained with an isotype control (Ab00102-23.0, panel A) or the rabbit-chimeric version of hP67.6 (Gemtuzumab) (Ab00283-23.0, panel B) at a concentration of 1 µg/ml for 30 mins at RT. 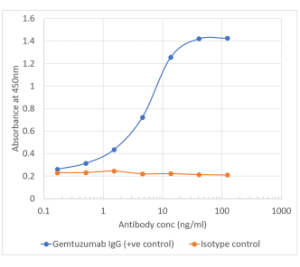 After washing, bound antibody was detected using a AF488 conjugated donkey anti-rabbit antibody (ab150073) and cells analysed on a FACSCanto flow-cytometer. Binding curve of anti-CD33 antibody hP76.6 (Gemtuzumab) (Ab00283-10.0) to human CD33 ELISA Plate coated with human His-tagged CD33 (Sino Biologicals, 12238-H08H) at a concentration of 2 µg/ml. A 3-fold serial dilution from 10,000 to 0.1 ng/ml was performed using Ab00283-10.0. For detection, a 1:4000 dilution of HRP-labelled anti-human kappa light chain antibody was used.